October 1, 1936 Malvina Hoffman’s sculpture, bronze figures and portrait heads depicting the Races of Man, exhibited for the summer at the Brooklyn Museum, remind us that "the proper study of mankind is Man,” and also convince us that the proper student of mankind is woman. 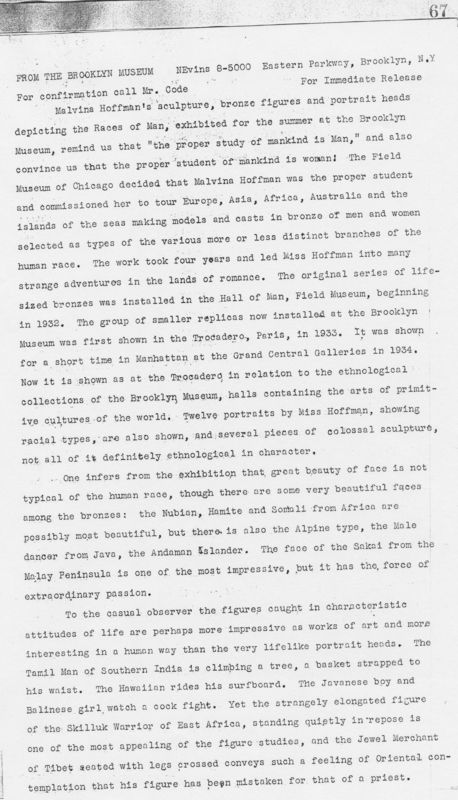 The Field Museum of Chicago decided that Malvina Hoffman was the proper student and commissioned her to tour Europe, Asia, Africa, Australia and the islands of the seas making models and casts in bronze or men and women selected as types of the various more or less distinct branches of the human race. The work took four years and led Miss Hoffman into many strange adventures in the lands of romance. The original series of life-sized bronzes was installed in the Hall of Man, Field Museum, beginning in 1932. The group of smaller replicas now installed at the Brooklyn Museum was first shown in the Trocadero, Paris, in 1933. It was shown for a short time in Manhattan the Grand Central Galleries in 1934. Now it is shown as at the Trocadero in relation to the ethnological collections of the Brooklyn Museum halls containing the arts of primitive cultures of the world. Twelve portraits by Miss Hoffman, showing racial types, are also shown, and several pieces of colossal sculpture, not all of it definitely ethnological in character. One infers from the exhibition that, great beauty of face is not typical of the human race, though there are some very beautiful faces among the bronzes: the Nubian, Hamite and Somali from Africa are possibly most beautiful, but there is also the Alpine type, the Male dancer from Java, the Andaman Islander. The face of the Sakai from the Malay Peninsula is one of, the most impressive, but it has the, force of extraordinary passion. To the casual observer the figure caught in characteristic attitudes of life are perhaps more impressive as works of art and more interesting in a human way than the very lifelike portrait heads. The Tamil Man of Southern India is climbing a tree, a basket strapped to his waist. The Hawaiian rides his surfboard. The Javanese boy and Balinese girl watch a cook fight. Yet the strangely elongated figure of the Skilluk Warrior of East Africa, standing quietly in repose is one of the most appealing of the figure studies, and the Jewel Merchant of Tibet seated with legs crossed conveys such a feeling of Oriental contemplation that his figure has been mistaken for, that of a priest. There is a torso of a Money Lender from Afghanistan who seems to have fattened on his trade. The Sicilian Fisherman with his net has something of the rugged action characteristic of Malvina Hoffman’s great teacher Rodin. The Pygmy from the Ituri Forest in Africa and the Kalihari Bushman Mother and Child, the dancing girl, a Dalboa of the Sara Tribe, all suggest the primitive feelings of the jungle as definitely as if the tangled forests could be seen around them. As a means of conveying rapidly the variety of human life the collection is as effective as the Trustees of the Field Museum and the courageous woman sculptor knew that it would be. Brooklyn Museum Archives. Records of the Department of Public Information. Press releases, 1931 - 1936. 04-06_1936, 087-8.